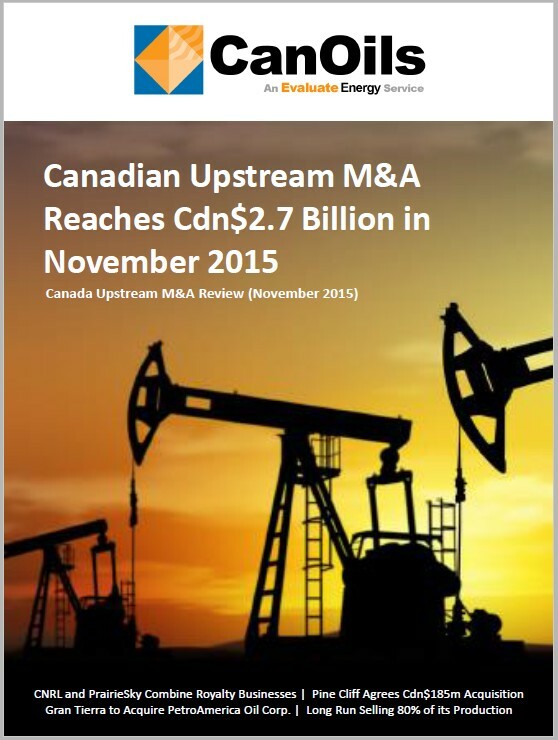 Analysis in CanOils’ new report “Canadian Upstream M&A Reaches Cdn$2.7 Billion in November 2015” shows that the total value of upstream deals in Canada was over Cdn$1 billion for the second month in a row, after a slow period between July and September. 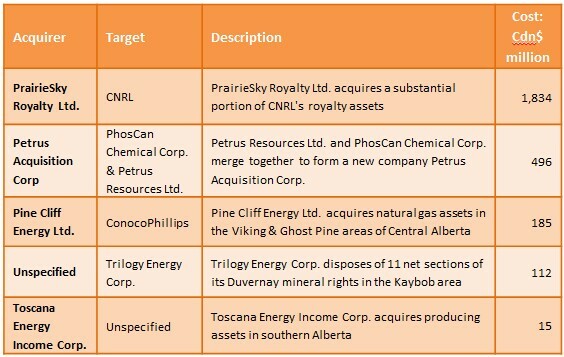 The vast majority of this total emanated from the month’s biggest deal, which was a continuation on the trend of Canadian majors divesting royalty properties for values seemingly unperturbed by the slump in oil prices; PrairieSky Royalty Ltd. acquired certain Canadian Natural Resources Ltd. (“CNRL”) royalty assets for Cdn$1.8 billion. Elsewhere, the rumours of Pine Cliff Energy Ltd. acquiring a portion of ConocoPhillips’ listing of 35,000 boe/d of Canadian production proved to be true with an announcement during the month of a Cdn$185 million purchase. It was also a busy month for Canadian companies operating outside of Canada. Gran Tierra Energy Inc. became the latest Canadian-listed company to strike a deal in the Llanos and Putumayo basins of Colombia as it agreed to acquire Petroamerica Oil Corp. for around Cdn$110 million. There were also significant deals for Canadian-listed companies in the U.S., Europe and Africa this month. 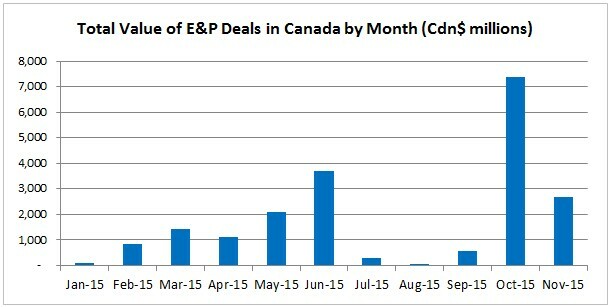 Insights from CanOils’ M&A database, as well as data from CanOils’ Assets, Financings, Financial & Operating and Oilsands databases, help to provide a thorough, independent overview of the month’s most significant deals in the Canadian oil and gas industry in this report. 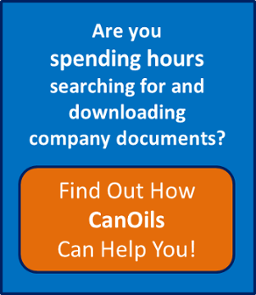 Sign up to the CanOils & Evaluate Energy Mailing List here and be informed as soon as new analysis reports like this are available.